What is your definition of magic? Does it involve sawing a woman in half or pulling a rabbit out of a hat? Or maybe you envision robed figures casting circles and carrying out complex rituals to create their spiritual objectives. I believe that magic surrounds us every minute of the day, and most of the time we are not even aware that it is there. When I first started being aware of energy years ago, I started seeing connections between various spiritual systems throughout the world and across time. I became curious to research, read and observe as many of these systems as I could just to see how they are connected through their similarities. What I am concluding is that magic or manifesting or energy work or whatever that system may choose to call it is basically about recognizing that all “things” are made of energy and that your thoughts are basically “things” in that they contain enough energy to bring about an intention. It’s interesting observing many people thinking that the knowledge contained in books like, The Secret , is new knowledge….knowledge of the New Age. It’s actually been around for ages, probably since the beginnings of human existence. I, myself, believe that all things in nature carry an energy that we humans can work with to achieve our manifesting objectives if we choose to do so. This, again, is not a new concept. Our grandparents may have had some strange customs, but when you look at those customs with a magical eye, you can see that they are more than just some old superstition. I was reading an article recently about the Appalachian Granny Women or Granny Witches. They were a direct descendant of the Wise Women of Europe and brought customs from the Old World which mingled with the Cherokee healing and magical customs to create a new form of folk magic. These Grannies were the doctors and especially the midwives that the common folk consulted for their medical and emotional needs. I especially enjoyed reading about how the Granny would assist during a woman’s labor. She would place an ax under the woman’s bed to cut the pain. She would open all the windows to help the woman to dilate so the delivery would go more smoothly. She also had herbal remedies she would administer to the expectant mother based on the herbal knowledge that had been passed down through generations. Some might laugh at some of those “primitive” beliefs, but really, were they useless acts that had little to no effect on the new mother or others present during the birth? Many magical practitioners will tell you that it is always helpful when casting a spell to have a physical prop or representation to assist in the magical work. Placing the ax under the bed and opening the windows was really just that. The combined energy of thought and the physical acts that demonstrated belief or faith were more integral to the success of a delivery than modern medicine would probably ever admit. The Granny was performing a magical act by simply focusing her intention and acting upon it. 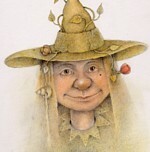 Folk magic is a type of magic that is interwoven into the daily lives of the people in a culture. It is very informal and user friendly. I remember years ago when my mother was visiting the house we had a new puppy. The puppy kept sneaking into the kitchen and stealing my dish rag. He would run away happily expecting me to chase him. My mother laughed and made the comment, “He’s trying to cure his warts!” “What?,” I asked. “That’s what my grandmother used to say when I was a child,” my mom replied. “If you want to cure your warts, hide your mother’s dish rag!” Of course we both laughed at the idea of the puppy trying to cure his warts, but I bet her Granny was at least a little bit serious when she told mother about the cure for warts. After all, isn’t manifesting all about carrying through on your intention? We all do magic all the time, even if we don’t realize we are doing it. I am focusing on seeing and experiencing, and even making some magic every day now. I hope your life is filled with magic, too!